Precautions against Cholera, 1853] This handbill was issued by the parish of St James in Westminster, and comes from the time of the third major outbreak of cholera in London in the 19th century. It makes suggestions about food, clothing to help fight against cholera and identifies available medical practitioners. 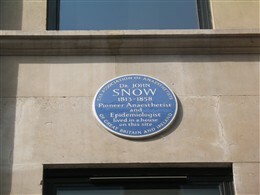 John Snow is regarded as one of the founders of epidemiology for his work in discovering the source of cholera. Originally born in York , John Snow came to London in 1836 and in October of that year he enrolled at the Hunterian School of Medicine, 16 Great Windmill Street . This school had been established in 1789 at the home of William Hunter (1718-1783) who, along with his younger brother John Hunter (1728-1793), was a Scottish pioneer of medicine and surgery and a collector of paintings and scientific instruments. In 1837 Snow began work at the Westminster Hospital . He subsequently became a member of the Royal College of Surgeons in 1838 and was eventually admitted to the Royal College of Physicians in 1850. Snow gradually began to question the accepted belief that cholera was caused by breathing “bad air” and was spread by airborne transmission, and in 1849 he published an essay titled On the Mode of Communication of Cholera . However it was only in 1854, in Broad Street (now Broadwick Street), that Snow had the opportunity to prove his theory. Soho had far fewer cases of cholera in the 1832 and 1849 epidemics than other areas of London , and was thought of as a healthy district. But in 1854 there was a sudden explosion in the number of cholera cases. 200 people died from the disease during the first two days of September, and within just ten days of the outbreak 500 people perished. Report on the Epidemic, Middlesex Hospital. It was the worst outbreak of cholera London had ever seen. Despite the best efforts of the hospital staff over half of the cholera cases admitted during the outbreak died. John Snow, a doctor living in the area, did not believe that cholera could be caused by ‘bad air’, because if that was the case it would first attack peoples’ lungs. Since cholera began with diarrhoea it had to be caused by something going into the stomach. 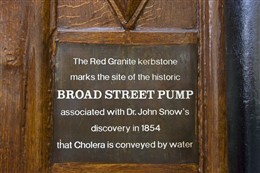 Snow mapped the cholera deaths within Soho and noticed they were all close to the water pump in Broad Street . On examining a sample of water from the pump under a microscope he found it was infected, and asked the authorities to remove the pump’s handle to stop people drinking the water. Although unsure, they did as he asked. The result was spectacular as the number of people becoming ill immediately decreased. Another local resident, The Reverend Henry Whitehead – a curate at St Luke’s Church, provided hard evidence that the pump was the cause of the outbreak. On hearing that a baby living at 40 Broad Street , the house closest to the pump, had died of cholera, Whitehead went to investigate. Like most of the houses in this poor area, there was no proper toilet – just a hole in the ground with a pit (or ‘cesspool’) underneath. The mother had washed her sick baby’s nappies in a bucket and emptied the dirty water into the cesspool, which was just three feet away from Broad Street pump. Whitehead reported this, and an inspection of the cesspool was ordered. It was found to be old and decayed, and sewage had definitely leaked into the well underneath the pump. The final proof that the pump was the cause of the epidemic, came when it was linked to a case in Hampstead. On the 31st August a woman living in Hampstead drank water from a bottle filled at the Broad Street pump. She died three days later. Her niece visiting from Islington had also drunk the water, and died on her return home. 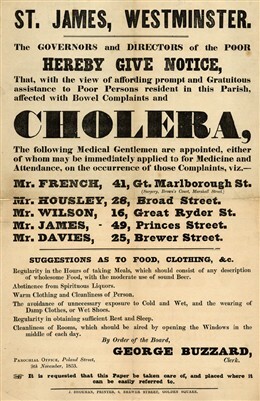 There were no other connected cases of cholera in either Hampstead or Islington. It was confirmed: infected water was to blame for the spread of cholera. A Medicinal tipple: Although Health Boards warned against drinking alcohol, in fact it was found that those who drank alcohol were less likely to get cholera, because they drank less contaminated water! Dr Snow and the Reverend Whithead helped pave the way for a whole new approach to the prevention of further outbreaks of the disease. There was only one more major outbreak of cholera in London , in 1866. The source, a dirty water supply, was quickly traced and the epidemic stamped out. 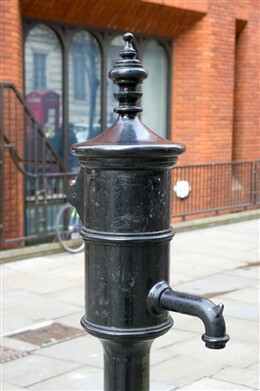 If you visit Soho today, a pub marks the site of the Broad Street pump. 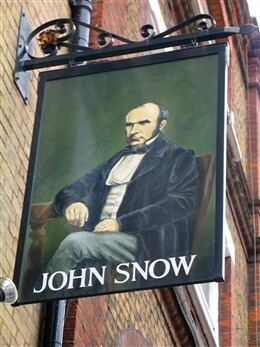 The John Snow pub on Broadwick Street , is named after the local hero who helped save so many of the area’s residents from the terrible epidemic of 1854. This page was added by Tim Devitt on 25/03/2010.